Javier Plascencia was a guest chef at Loteria Grill's Hollywood and Santa Monica locations in June. Tijuana has become recognized worldwide for its Baja Med cuisine, Baja cuisine in general, and street food, namely seafood tacos and ceviches. Chef Javier Plascencia has been the main player in spreading the word about Tijuana’s food in the last five years. 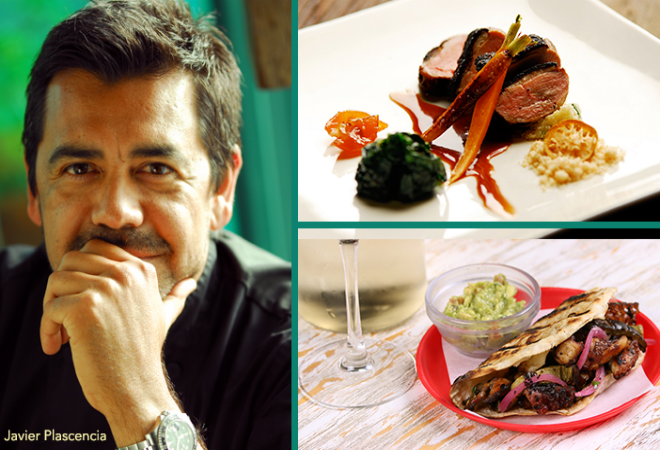 Plascencia has received many accolades for his three-year-old Mision 19 in Tijuana, and will soon open Bracero in San Diego, making him one of only three prominent chefs from Mexico to have restaurants in the U.S., the other two being Enrique Olvera (Cosme in NYC) and Aquiles Chavez (La Fisheria in Houston). This Thursday, January 8, Plascencia will make his first major prime-time television appearance in the U.S. as a mentor on ABC’s The Taste, alongside Anthony Bourdain, Nigella Lawson, Marcus Samuelsson, and L.A.’s own Ludo Lefebvre of Trois Mec and Petit Trois. Plascencia was featured on the Baja episode of Travel Channel’s No Reservations with Bourdain, so when Bourdain’s team decided on a Latin-themed episode of The Taste, they reached out to the Tijuana-based chef to guest-mentor the contestants on Mexican cuisine’s bold flavors from the street stands and traditional dishes. On Thursday night, you’ll see contestants compete for the chance to be mentored by Plascencia, “I showed them a Latin-inspired dish—they’re all experienced chefs and their attitude was great—they wanted to learn and asked a lot of questions, which I liked, “ says Plascencia. The chef had lots of fun talking to his fellow mentors off camera about food, restaurants, and tequila, but admits that having to send a chef home made him feel “bad, real bad.” Tune in to Thursday night for this special Latin episode with Plascencia and for a little bit of Tijuana in your own living room.